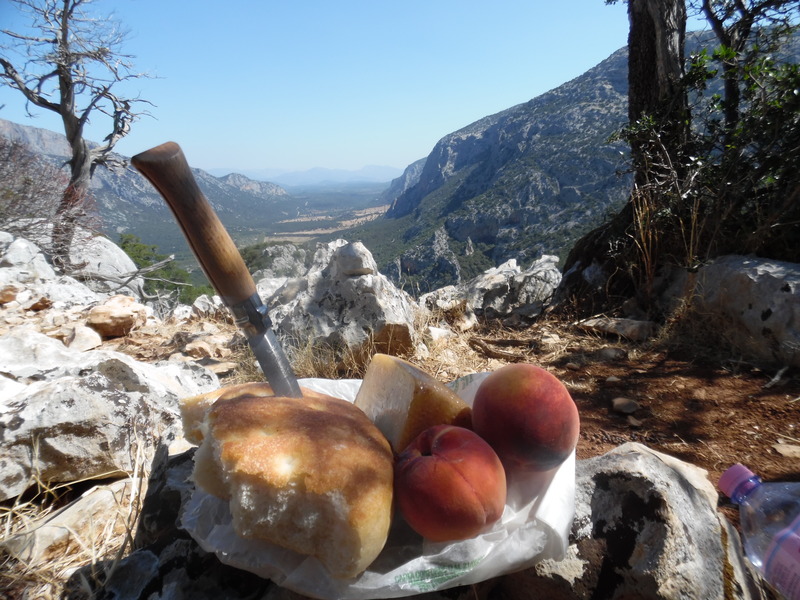 Discussion in 'Opinel Users Group' started by mtnoutdoors, Jun 21, 2018. Stags Crest, BCWoodsman, Wesleypipesyo and 12 others like this. Stags Crest, Tom Eickenberg, BCWoodsman and 11 others like this. gila_dog, Timex, pellegrino and 8 others like this. 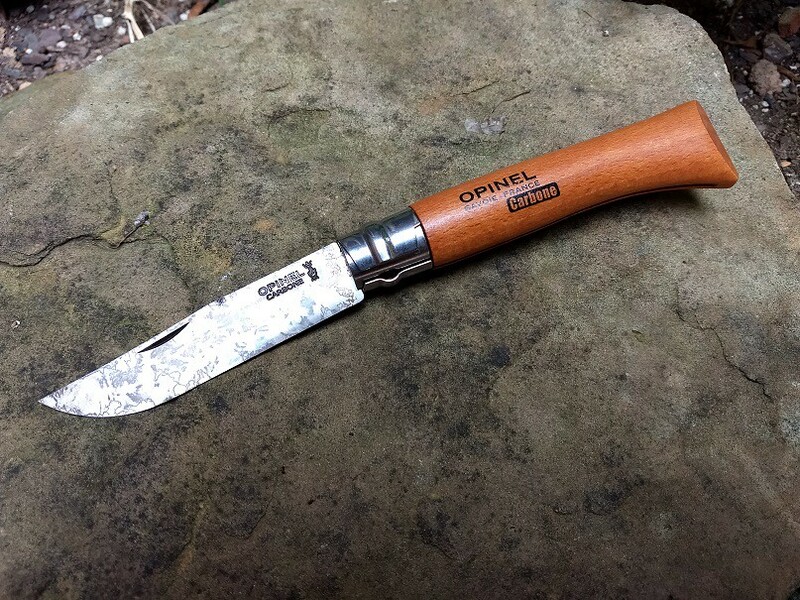 Opinel #8.... a great yard knife! Stags Crest, BCWoodsman, Mookietherooster and 10 others like this. Winterhorse, SmilinJoe, Beach Hiker and 5 others like this. Stickied this thread so it is at the top and us old farts don't have to try to find it....! Winterhorse, woodsmanjohn, SmilinJoe and 4 others like this. Beach Hiker, MrFixIt and FIELDCRAFTLTC like this. Stags Crest, BCWoodsman, pellegrino and 10 others like this. Stags Crest, BCWoodsman, GoFeesh and 13 others like this. GoFeesh, Youcantreadinthedark, Winterhorse and 4 others like this. 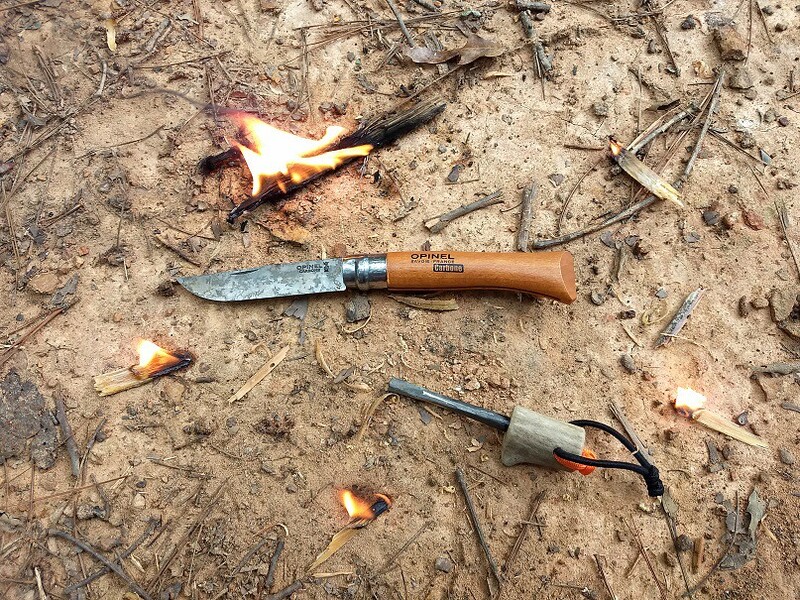 My French Opinel running rings around an Air Force survival knife in the kitchen. Part of a torture test on the AF knife. Stags Crest, BCWoodsman, Winterhorse and 5 others like this. winter1857, Stags Crest, BCWoodsman and 12 others like this. Stags Crest, BCWoodsman, Traditionalist and 11 others like this. Stags Crest, BCWoodsman, winter1857 and 9 others like this. Top is a garden #8 that I swapped a stainless #8 blade to. Stain is green leather dye. Stags Crest, BCWoodsman, Timex and 9 others like this. Stags Crest, BCWoodsman, pellegrino and 8 others like this. Good thing you said it was dye. I'd have sworn it was mold. Didn't turn out dark as I would have liked, thats for sure! MrFixIt and ExAF1N1 like this. That's really cool! Did you carve those? Burn them? LarryB, Stags Crest, BCWoodsman and 8 others like this. 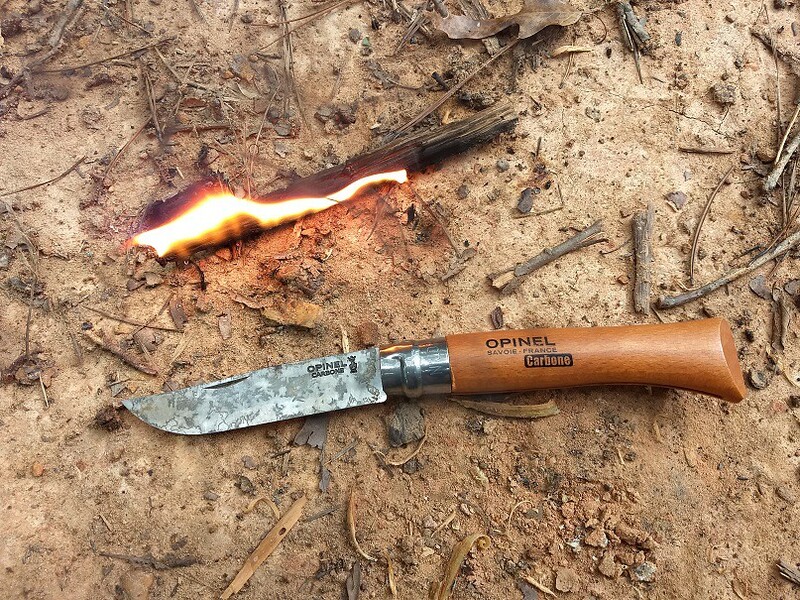 No...I didn't burn the design myself....order a new opinel from their web site...and for 6 or 7 dollars they will put any words or design on it you want. woodsmanjohn, Primordial, MrFixIt and 2 others like this. Love the patina - very unique for sure!!! woodsmanjohn, MrFixIt and mtnoutdoors like this. I made my #6 prettier. Stags Crest, BCWoodsman, pellegrino and 7 others like this. LarryB, Traditionalist, Stags Crest and 13 others like this. I'm guessing France from the pressed cheese, baguette and knife? NevadaBlue, JasonJ, MrFixIt and 1 other person like this. Thanks, I believe I used mustard and a sponge. NevadaBlue and MrFixIt like this. Well, actually the Netherlands and Belgium, almost into france. Just touched down in the USA. Will post some pics in a TR. 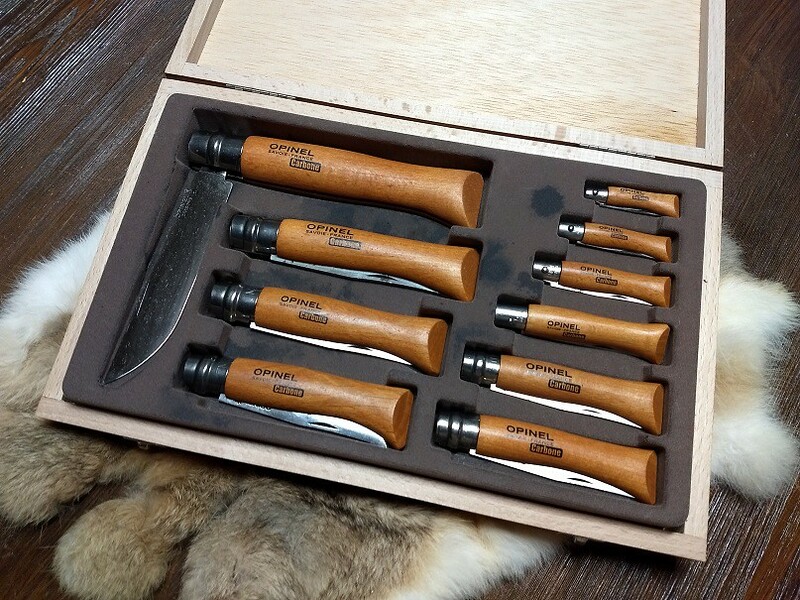 I can't recall seeing fancier Opinels made from the base model. Traditionalist, Stags Crest, woodsmanjohn and 10 others like this. Traditionalist, Stags Crest, BCWoodsman and 7 others like this. LarryB, winter1857, Stags Crest and 11 others like this. That is a nice photo. This is a great idea. Here is my Bubinga #8 i just love pocket knives best. They are just so practical and useful on a daily basis. Stags Crest, woodsmanjohn, BCWoodsman and 2 others like this. PMSteve, GoodPhotos, woodsmanjohn and 2 others like this. My goodness, what a beautiful mess of schrooms! Yum! LarryB and woodsmanjohn like this. My #6 completely modded. The #6 is by far my favorite Opie to edc, it is a very capable knife. winter1857, Stags Crest, woodsmanjohn and 7 others like this. woodsmanjohn and Falcon45 like this. That is a great solution. Forgot my SAK on a recent trip. I took my wife's vehicle so no back up (I decided not to inquire where her SAK's were). Did I ever suffer! I went to a nearby Bass Pro and was very disappointed in their selection of SAK's. I realized that I am fortunate to live about a mile from three shops that carry a great selection of knives. When I returned home, I found a SAK Rucksack on closeout from the Swiss Knive Shop, placed a SAK in my wife's vehicle, made sure a leatherman is in my archery stuff, check to see that my other leatherman is in my work bag, and immediatlely stuffed my SAK camper in my pocket! Yeah, I know that uncomfortable feeling of not having a pocket knife... Makes me a little queasy just remembering... Reflexively checking my pocket now....whew, OK I'm good. I tend to sprinkle a few of them in various packs and places too, but need to remember to clean those out before going to the airport. SMLE Guy and Primordial like this. Here is my #8 picking up the slack for a failed steak knife. The steak knife killer is a block of frozen raw dog food - tripe. I was not even really pressing that hard, but the thing just folded. This is the second of my son's steak knives I have broken like this in the last month trying to cut dog food. The Opinel bucks up the dog food like it was nothing. I will have to get my son a proper set of steak knives instead of these cheap plastic ones. Primordial and mtnoutdoors like this. Just get him a handful of no.8's. BCWoodsman, Mookietherooster, Falcon45 and 1 other person like this. Ha ha, now we're getting somewhere! I'm a little sad this thread hasn't even hit page 2 yet. Stags Crest, Primordial, Falcon45 and 3 others like this. Stags Crest, woodsmanjohn, pellegrino and 4 others like this. winter1857, Stags Crest, woodsmanjohn and 4 others like this.